The warm up was 1,000 loosen followed by 6×100 @ 1:15 desc 1-3, 4-6. Pretty standard. The kicker? You had to kick half way off of every wall or be beheaded (proverbially, in most cases) by the CHORD. I think every swim team needs a chord. The main set was 3 round of 4×75 @ 1:15 with paddles and ankle band (25 fast-25 ez-25 fast) followed by 10×50 200 pace @ :50 (:55 for breaststroke). You finish each round with 100 ex @ 2:00, then 8×25 FAST @ :20. 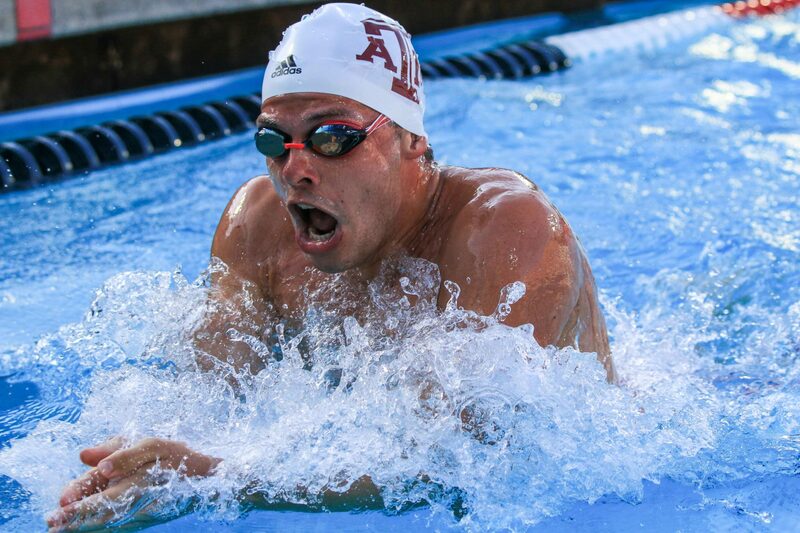 The A&M men had done this set 3 weeks in a row now, with slight variation thrown into it each week, and it’s an old fashioned how tough can you get set. It’s one that was fun to watch, and I’m guessing not quite as fun to swim.